Pentland Hills Walk, Edinburgh, Threipmuir Reservoir, Bavelaw Marsh. The Pentland Hills are within easy reach of Edinburgh but the rolling open country is far removed from the hustle and bustle of Scotland's capital city. Although low hills by comparison to their sisters in the Highlands, the ascents are nevertheless strenuous, but excellent views provide ample reward for the ups and downs involved. Aside from being a regional park enjoyed by walkers, the Pentlands also conceal 13 reservoirs providing Edinburgh and its environs with water. These are home to birds and wildlife. At Threipmuir Reservoir, Bavelaw Marsh, now a nature reserve, was created in the 1890s when the dam was raised. It boasts a wide variety of breeding and visiting wildfowl and 110 species of birds have been recorded in the area including great crested grebe, sedge warbler, coot and moor hen. To enjoy the Pentlands at their best, visit in the summer when the slopes are purple with heather and the sun shimmers on the water. You can tackle this trek at any time of the year but avoid in severe winter weather and allow extra time if there is snow on the ground. Leave the car park and follow the minor road west alongside a small burn. A short walk on and the road passes a wooden gate on the left. Here a small footbridge spans the burn. Cross and a path goes through a patch of mixed woodland to a stile over a wall at the other side. From there a short stroll over an open field takes you to the start of the ascent proper. 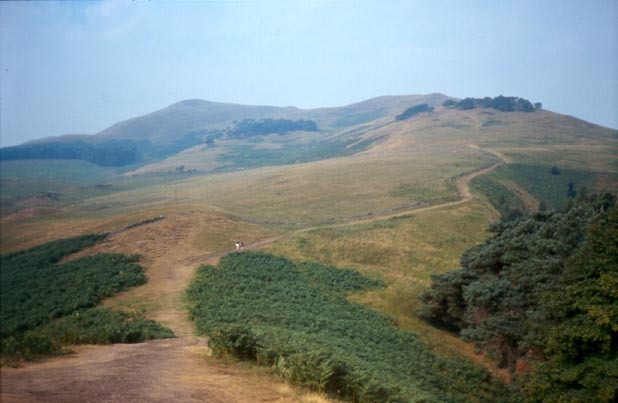 The path climbs gorse and then bracken covered hillside, rising over a series of mounds with the summit of Turnhouse Hill in view up to the left. There are a couple of stiles to cross as the path makes its way up to a clump of trees on the first shoulder. Here the way flattens out briefly with a view down to Glencorse Reservoir on your right before rising to the top which is marked by a cairn. If you hear shooting, don't worry, it's only the rifle range on Castlelaw Hill to the north. Descend to another small cairn-topped summit then drop down into the col between Turnhouse Hill and the next top, Carnethy Hill. As the path descends you can make out the obvious remains of an ancient fort on a low hill to the left. At the pass, cross a wall and fence by way of a stile then begin the ascent with the path climbing up through heather and tussocky grass. 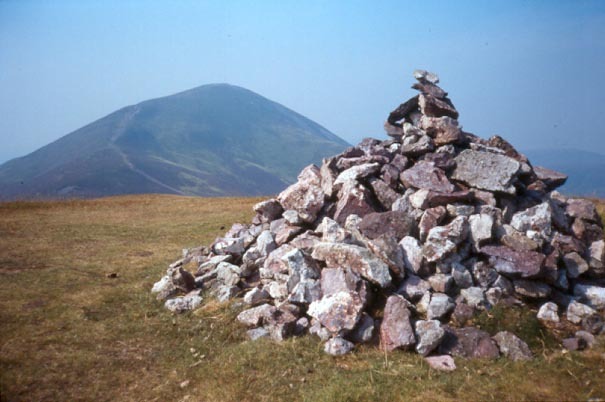 The stony summit of Carnethy Hill is marked by a cairn and, in the height of summer, it is a magnet for wasps, so be warned. Onwards and the path descends along the west shoulder of the hill to the next col. The path up Scald Law has recently been rebuilt due to erosion and a set of zig-zags help you gain height quickly and easily. The top boasts a trig point. 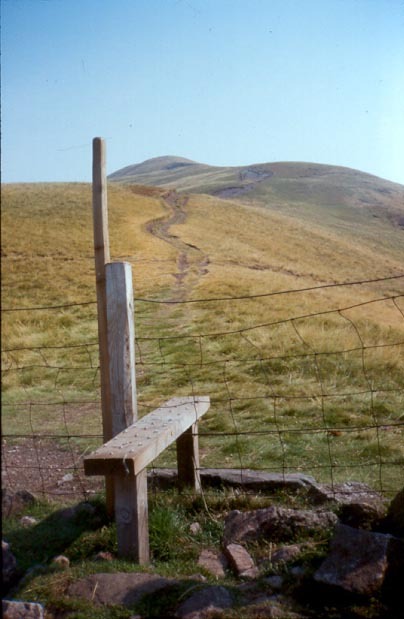 From Scald Law, the path drops a short distance before splitting. Take the right hand fork down then climb over the pointed tops of East Kip and West Kip. From there drop down to a good track. Follow the track west over open grass and heather moorland alongside an electric fence. After half a mile it swings right, crossing a stone bridge a short way on, before climbing up over the low valley to the west of Hare Hill. At the pass there is a gate and right of way sign pointing to 'Balerno'. Follow the track down towards woodland in the distance. The track skirts along the edge of a coniferous plantation before entering a strip of beech wood to emerge on to a minor road a few steps on. Turn right and at the next junction a short way on go left, passing down through an attractive avenue of old beech trees on a tarmac roadway. The road crosses the west end of Threipmuir Reservoir and continues to a nature reserve information board a short distance on. At this point, leave the road and turn right, crossing a stile. Follow a narrow path through shrubland to a track which runs on to the reservoir, along the west shore then across behind the embankment at the north end. At the far side of the dam, the path continues around the reservoir, initially passing through a small coniferous woodland but later emerging on to an open grassy bank separating the water from a field to your left. Follow it down to a small dam and stone shed. Cross the dam and behind the shed, to the left, a narrow path rises up through the bracken to skirt round the northern flank of Black Hill. This passes between it and neighbouring Bell's Hill then drops down to Logan Cottage and Glencorse Reservoir. From there, take the tarmac road clockwise round the loch back to the start. Map OS Landranger 1:50,000 sheet 66. Start/parking Flotterstone ranger centre on the A702, three miles south of the A720 Edinburgh city bypass (grid ref NT 233632). Grading Good paths over open hillside with some steep ascents. Some sections on minor roads.